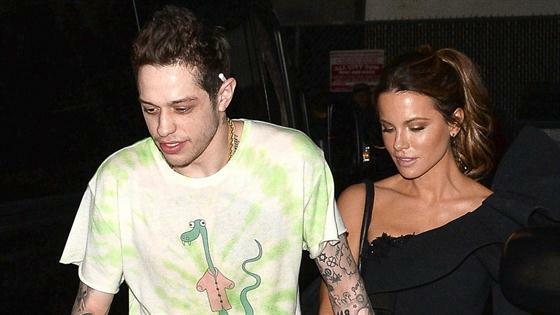 For Pete Davidson and Kate Beckinsale, it was a night out sealed with a smooch. It seems the flames are still burning for the SNL comedian and The Widow actress considering they were spotted out once again together on Monday night in Hollywood. This time, it was for The Dirt premiere, Netflix's upcoming film about Mötley Crüe. Davidson, who has a role in the film, posed for photographers earlier in the night in honor of the movie's debut at the ArcLight Hollywood while Beckinsale arrived separately and waited for Davidson inside with friends. While the comedian went solo on the red carpet, the actor was not alone as he later left with the famed actress and headed to the after-party in the same car. According to an eyewitness, they were holding hands and cuddling in the backseat. "She kept looking over at Pete and couldn't help but break out into the biggest smile," the eyewitness described. "They look like they are gaga for each other. But, that wasn't all the PDA for the night. According to the eyewitness, once they got to the iconic Whiskey A Go Go nightclub, they mingled with friends and watched Mötley Crüe perform for about an hour before Davidson led the actress by hand back to their car. Photographers then snapped the two as they went in for a kiss in the backseat. "Once they sat down, he leaned over and kissed her passionately. She was very into it and didn't want to stop," the eyewitness described. "They didn't care who was watching. They clearly just wanted to be together. They aren't shy with the PDA and look very happy together." Needless to say, sparks were certainly flying in Hollywood—and they've been flying between these two since they were spotted flirting at a 2019 Golden Globes after-party back in early January. According to a source, Davidson and Beckinsale looked "very cozy" as they sat closely together on a couch outside on a smoking patio for about an hour. "She was very flirty with him and there were definitely some vibes going on," the source described. "Pete was smiling and laughing with her and she was all about him." Since that night, they've confirmed the romantic suspicions by stepping out together hand in hand after attending a party together and later locking lips at a hockey game. Just days ago, Davidson broke his silence on his famous date on SNL. "Apparently, people have a crazy fascination with our age difference," he said. "But, it doesn't really bother us. But, then again, I'm new to this, so if you have questions about a relationship with a big age difference, just ask Leonardo DiCaprio, Jason Statham, Michael Douglas, Richard Gere, Jeff Goldblum, Scott Disick, Dane Cook, Derek Jeter, Bruce Willis, Harrison Ford, Tommy Lee, Alec Baldwin, Sean Pennand whoever the president of France is, Mel Gibson, Billy Joel, Mick Jagger, Sylvester Stallone, Eddie Murphy, Kelsey Grammer, Larry King, Larry King, Larry King, Rod Stewart and Donald Trump."